Playing Dark Souls 3 is tough enough with a regular controller, but trying to play it with voice commands is… wait. I feel like I've written about this before. While YouTuber Slimecicle isn't the first person to try playing through a Souls game with naught but voice recognition software, his attempt doesn't go quite as smoothly as bearzly's incredible Ornstein and Smough fight back in the original Dark Souls. I'm going to blame most of that on Slimecicle's significantly less precise voice setup (it really does not want him to roll) and the fact that he hasn't tried the Iudex Gundyr fight 111 times yet. Practice makes perfect! 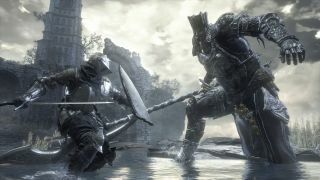 Meanwhile, at least one person has killed Dark Souls 3's final boss at level 1 with no armor, dodging, or blocking. But can they do it with voice commands?